So while I freeze in the very snowy weather in UK, i managed to stay home (ooo I stay home all day anyway) and take more photos with iphone. Seriously, The iphone camera functionality is not bad at all. Anyway, Jennifer managed to haul this for me from Hong kong as I wanted to try this. She got OC3 under my instruction ‘get the shade which is darker than yours’ and hence OC3. Apparently is the Number 1 seller in Japan, and it is design especially for Asian woman. Also according to what I read online, it is really good if you are SE Asian woman as all reviews ‘complain’ it is rather dark. It starts the shade from OC1 which is roughly NC 20. Some even say OC1 is equalivent to a NC30 to start with.Anyway, what I want to say is this is a foundation for ladies with medium skin tone. What do I think of it. To start with, and unfortunately. The shade is a bit too dark. It think OC3 is even for girls of NC35-37. The texture is rather dry even I wet my sponge to apply. But if you moisturise and prime your face well (i.e. I tried with priming Laura Mercier Hydrating Primer) it solved the drying area around the nose. Coverage is good, not as heavy a the liquid version but good enough as a travel companion to use on its own. Smooth on applying, and I can’t fault it at all. Yes. All medium skintone ladies which absolutely haul one. We should support a company who ‘accidentally’ made something especially for us. P.S. I am also selling this away if anyone wants it. 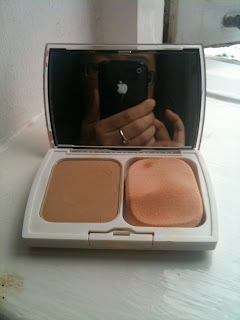 (I must dejunk my foundation) I’m creating a sales haul, but if anyone wants this I’ll sell this for £4 without case. Swatched once. the darkest and not very easy to swatch either. It took at least 3 swatch to show up here on the cotton pad. aiya, too bad it doesn't match your shade! but you can always pick up from Watsons, Mannings when you're in HK in march!!!! !